About us - Photo Hélico inc.
Yves Tremblay is a photographer for 26 years. He has made press photographies in Canada, United States and Germany. In 1992, he starts using a helicopter. It becomes a passion for him. In 2001, he founds Photo Hélico inc. that is specialized in aerial photography in low altitude. 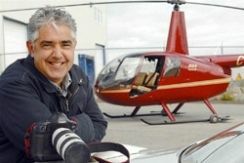 Yves accomplishes air missions in Québec, Canada and United States. He is married and father of four boys. We possess 400 000 photographies. Many Cities of Quebec are represented like Montréal, Québec, Gatineau, Sherbrooke, Saguenay, Val-d'Or, Gaspé and more. Furthermore, we serve the rest of Canada and the American states of New England. We also offer air missions including ground tracking, flight low altitude permission, aerial photography session with 20 to 30 HD pictures on the cloud or on cd-rom. we can fly quickly depending on weather conditions. 2018 : Episode 3 of Fugitifs on Canal D in march. 2016 : Book Launch Les plus belles maisons du Québec vues du haut des airs. 2014 : Judge at the World Congress Competition of the Professional Aerial Photographers Association (PAPA). 2012 : Queen Elizabeth II Diamond Jubilee Medal. 2011 : Personality La Presse Radio-Canada of the week (march 14). 2009 : Epson Aerial Photographer of the Year Award - Professional Aerial Photographers Association (PAPA).